The Season of Advent is coming, and you know what that means: end of year giving appeals. Writing a letter that inspires people to donate will be a defining factor in how much you raise. Your letter must speak to people’s hearts, be concise and — most importantly — clearly state your request for a donation. To sum it all up: your appeal letter must capture people’s eyes, hearts, and minds, and guide them all in the same direction towards sending you a donation. After writing hundreds of appeal letters, I’ve found what works best, especially when writing to a Catholic audience. These are not fundraising tricks. I don’t believe in using tricks for one simple reason. We are created in the image and likeness of God, and that means we are designed to give because God is the greatest giver of all. Remember: we are designed to give because God is the greatest giver of all. You will find my tips focus on our Catholic faith and most importantly, your mission. By following these simple steps, you will feel more comfortable about sending your letter, and you should see a boost in donations. Catholicism has a rich history of art, beauty, and orthography. Take for example the manuscripts of monks written in past centuries. Can you imagine the hours they spent transcribing Scripture onto their beautiful illuminated manuscripts? Or consider the stained glass windows in churches, cathedrals, and chapels that tell the Gospel stories and the lives of the saints. 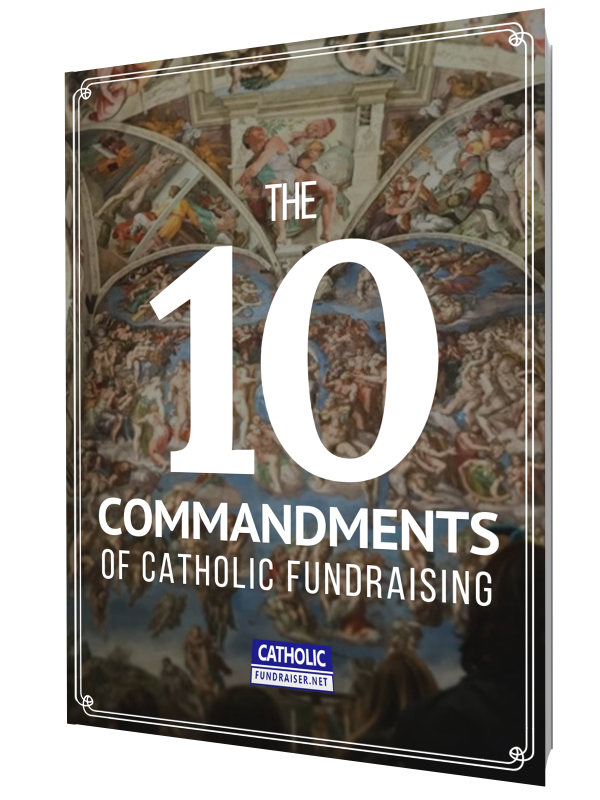 If Catholics in past centuries (and even today) can spend days, months, and even years crafting these works of art, we can take a few hours designing a template that reflects our Catholic charities’ missions. Thankfully, we live in the 21st century, and software, such as Adobe Illustrator and Canva, provide us with tools (often free) which we can adapt to our needs. I also recommend reviewing documents, brochures, adverts, or bulletins which have attracted your attention. These may come from any journals, magazines, websites, or advertisements. Examine why you like them so much. Then, design a new template by combining all the elements you liked most. Check out the website Canva.com for templates and design ideas. I recommend that your letter convey one message: how you are doing wonderful work and would like their financial support. This can be summarized in two or three sentences. Every other sentence in your letter should then support this central idea. I say this because people’s reading habits (especially for appeal letters) are quite short. They tend to skim a page in a couple of seconds, scan only for the key points, and then make a decision. I suggest that you limit your use of adjectives and compound sentences. Paragraphs and sentences should be short, particularly if writing an email or creating content for your website. People primarily read the first and last paragraphs of a letter or page, so open with a strong first paragraph and close with a lasting, impactful paragraph. If you want to share a story with your reader, pick your best one and leave out the extraneous details. If you must provide additional information, and your message risks becoming lengthy, I recommend adding an addendum or a hyperlink. You can also include additional text as a separate document. As Catholics, you and I know that panic and fear are not gifts of the Holy Spirit. We may be distraught, but God is calling us to respond to challenges with wisdom, understanding, counsel, fortitude, knowledge, piety, and fear of the Lord. Therefore, when you write, be positive, hopeful, and motivational. I recommend you share a story of how you have transformed your community, shared the Gospel to people or inspired others with your Catholic faith. Then, when you do ask for donations, ask people to help keep the momentum. People are more inspired to donate when they hear great things are being accomplished. Question: What do you think is the best recommendation for Catholics to follow when writing an appeal letter?